Here you can see wich bosses are dropping wich Warframe parts. Atlas components will drop from Jordas Golem. Banshee can be researched in the Tenno-Lab. Chroma blueprint will drop at the quest The New Strange.The parts will drop at the junctions. Ember compnents will drop from General Sargas Ruk (Tethys/Saturn). Equinox components will drop from Tyl Regor (Titania/Uranus). Excalibur compnents will drop from Lieutenant Lech Kril (War/Mars). The blueprint for Excalibur Umbra is given to players upon completing the first mission of The Sacrifice quest, and the ability to build the Warframe is granted on completing the second mission. 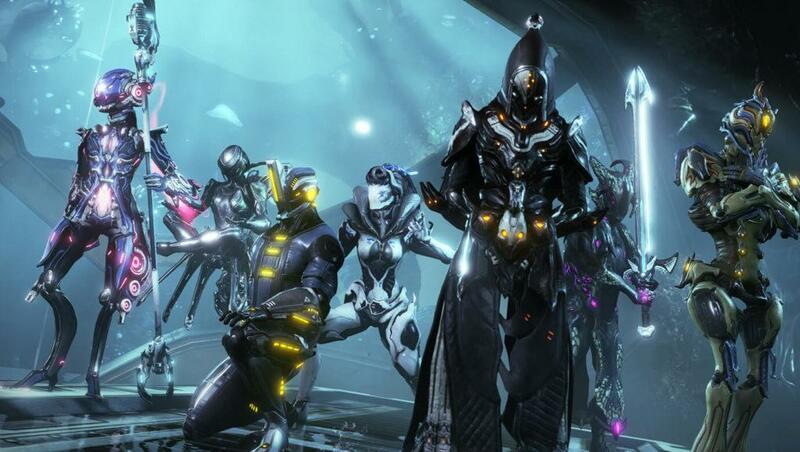 Unlike other Warframes, Umbra requires no further components and is constructed entirely from the single blueprint. However, even after being crafted, Umbra cannot be used until the penultimate mission. A second blueprint will not be given on replays.At the end of the quest, players will receive Excalibur Umbra at rank-30 with a free, pre-installed Orokin Reactor, and Warframe slot. Frost components will drop from Captain Vor and Lieutenant Lech Kril (Exta/Ceres). Gara's main blueprint will be awarded upon completion of the Saya's Vigil quest. Gara's component blueprints are acquired from Bounties at the "Plains of Eidolon". Harrow's main blueprint is awarded upon completion of the Chains of Harrow quest. The Chassis blueprint is acquired from Void Fissure enemies, the Neuroptics blueprint can be found from Rotation C vault on Pago, Kuva Fortress, and the Systems blueprint are rewarded from Defection missions on Rotation C.
Hydroid components will drop from Councilor Vay Hek (Oro/Earth). Inaros compnents will drop from the quest "Sands of Inaros" (You can by the quest from Baro Ki'Teer ). Ivara's main and component blueprints are acquired from Spy missions (including Nightmare Mode) depending on mission level. Alerts and sorties do not reward identified caches therefore are exempt. All parts are in Rotation C of their respective reward tables, meaning they require three successful data extractions to be an eligible reward for the mission. Loki components will drop from Hyena (Psamath/Neptune). Mag components will drop from The Sergeant (Illad/Phobos). Mesa components will drop from Mutalist Alad V, blueprint in the market. Nekros components will drop from Lephantis (Orokin Wrack). Nezha research in the Tenno lab. Nidus' main blueprint is acquired from The Glast Gambit quest. Nidus' component blueprints are acquired from Rotation C of Infested Salvage (Oestrus, Eris). Nova components will drop from Raptor (Naamah, Europa). Nyx's component blueprints are acquired from Phorid assassination missions during an Infested Invasion. Octavia's main blueprint is acquired upon completion of the Octavia's Anthem quest. The Chassis blueprint is rewarded from the Lua music puzzle, the Neuroptics blueprint is rewarded from Rotation C of Orokin Derelict Survival, and the Systems blueprint can be found in the A Rotation Cache of Lua Crossfire missions. Oberon's component blueprints are acquired from Eximus units. All Eximus units have a 1% chance to drop a component blueprints. Rhino components will drop from Jackal (Fossa/Venus). Saryn components will drop from Kela De Thaym (Merrow/Sedna). Trinity components will drop from Ambulas (Hades/Pluto). Titania's main and component blueprints are obtainable from The Silver Grove quest. The quest is obtained from the New Loka leader at any relay. Valkyr components will drop from Alad V & Zanuka (Themisto/Jupiter). Component blueprints are obtained exclusively as alert mission completion rewards. Volt can be researched at the Tenno-lab. Zephyr can be researched at the Tenno-Lab.